Susan Brannon Launches a Kickstarter Crowdfunding Campaign- A photography workshop with Portland, Oregon’s homeless to generate their voice through images and text. Portland, Or — Susan Brannon has launched a crowdfunding campaign on Kickstarter.com, in hope of raising a total of $750 to help fund the distribution of disposable film camera’s to Portland’s homeless. Supporters are invited to make a contribution ranging from $1 to $200. Donors won’t walk away empty-handed. Contributors will receive a thank you gift, ranging from a digital image of their choice to a 2 hours photo tour- workshop. Please take a moment and visit this Indiegogo. Be The Hope began as a dream and desire to do more. My name is Heather Hinze and I am a 40(ish!) single mom of a 16 year old daughter and a licensed foster parent. Thanks to a pair of shoes, a book, water, a burlap bag and a hatred of cubicles I am taking a leap of faith to realize my dream of changing the lives of children in Haiti. To learn more about how it all started, please visit my blog: www.bethehopehaiti.wordpress.com. Be The Hope is a non profit organization with a mission to provide a backpack full of school supplies to children in Haiti, which will help alleviate the financial burden on their families. We believe education is a human right, not a privilege. We are starting with 150 children in Cite Soleil. The children are from Agape Orphanage, La Main Tendre Orphanage, Frem Orphanage, Cite Soleil Youth Center and Mix Emmanuel Primary School. Cite Soleil is in Port au Prince, Haiti. It is the poorest and most dangerous area in the Western Hemisphere and also one of the largest slums in the Northern Hemisphere. An estimated 150,000 of Cite Soleil’s residents are orphaned or abandoned children. Seventy percent of these children are school age; however they do not attend school. In Haiti, 55% of the population lives below the poverty line of $1.25 per day. Due to the cost of school fees, school supplies, and uniforms many families can’t afford to send their children to school. We believe if all Haitian children had access to an education, their potential to both end the cycle of poverty and contribute to the recovery of Haiti would increase. According to UNICEF, education contributes to greater civic participation and helps to combat youth violence, sexual harassment and human trafficking. It also results in a range of health benefits including lower infant mortality, reduced domestic violence and improved child nutrition. For many Haitian children, a school lunch is the only meal that they can count on receiving all day. Education can foster social empowerment, enabling an entire generation to become economically independent and positive contributors to society. 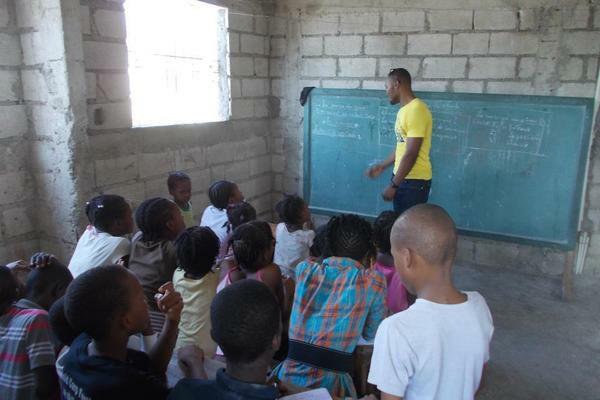 Education is an important part of the successful rebuilding of Haiti. We have partnered with a company that will pre-assemble the backpacks to our specifications. A complete backpack can be purchased for only $25.00! If you’re a parent of a school age child, think about what you spend every year on school supplies. If you’re like me, the backpack alone is more than $25.00. If we do not reach our fundraising goal, we will purchase as many backpacks as we can with the funds raised. If we surpass our goal (as we hope we do! ), there are many more things that we would like accomplish! The schools are also in need of chalk, chalkboard erasers, and arts and crafts supplies. There’s already another school of 106 children that is in desperate need of help and we would LOVE to help them. No penny will go to waste! We understand that some people just can’t contribute financially, but you can still help us reach our goal! Please tell ALL of your friends, family, neighbors, and colleagues about our cause and this campaign. Share this campaign with Indiegogo share tools. Share with your email lists and social media contacts. Set up your own fundraising event to benefit Be The Hope’s mission! Hey Everyone. We’re a marketing company that actually believes in making the world a better place. We know this is a weird concept for a marketing company but it’s one we believe strongly in. For the past few weeks we’ve been marketing several Kickstarters and Indiegogo causes for free. We figure it’s a good way to get word out about our company and help others. If you need marketing help or have any questions at all about getting your Kickstarter seen please let us know!